I'm still collecting MP3s for my long driving hours. Eric wanted to watch one of the Lord of the Rings movies tonight. There is an art to watching movies which have scary bits. First get comfortable in the lounge chair. Gather a lovely warm blanket around yourself. Place your hands in position. When a scary bit comes on screen lift the blanket. 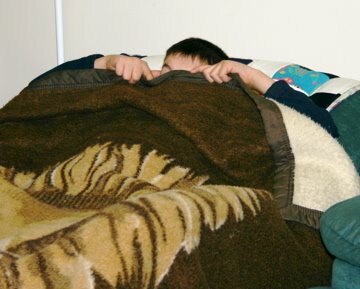 When you hear the scene change, peek over the blanket. This week's The Carnival of Family life is now up and interesting as usual. Pink Diary's list of children's book titles are all fiction. At least I hope so! Our contribution showing Rose's assistance is included. Everyone has jobs to do around the home. The way to survive a larger family is to ensure all members contribute in whatever way they can. And to make life harmonious, to do those jobs without complaining. It may not be fun, but there is a certain satisfaction knowing that your assistance is an obvious help for those around you. 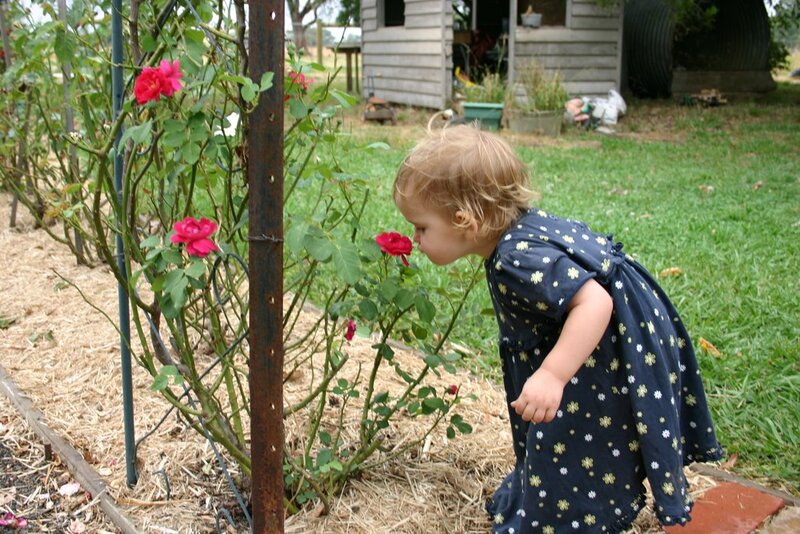 Rose (pictured) sees the boys leave the house to collect firewood and runs along behind them to help in her way. The boys select a log which is light enough for her to carry and she cheerfully brings it in to me or whoever is stacking the wood box inside. The look on her face in this photo is because I asked her to wait whilst I took a photo. Eric mixing the plaster and Ariel scraping off excess. Back in the late 1980's I had just discovered wargaming - a better word to describe playing with toy soldiers. Wargaming involved not only collecting and painting the figures and models, but also creating the scenery. There were many methods for creating buildings, but for a cash strapped lad, Linka proved to be a very cost effective way to make realistic models. Linka was a system which used plaster poured into moulds for various sections of buildings - walls, roofs, doors, windows and so on. I made quite a number of great looking buildings including a nicely detailed church using the stone moulds. Then Linka went out of business and that was that. Thanks to the Internet I discovered Linka World, a company which has reproduced the moulds and sells them internationally for $10 (US) a mould. We had a session creating pieces yesterday with everyone joining in - mixing the plaster, pouring it into the moulds, scraping the excess once it was partly set, then removing the completed pieces. Once we create some buildings we will post some photos. 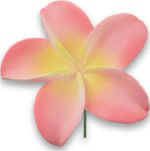 The Linka World website has plenty of samples to show. 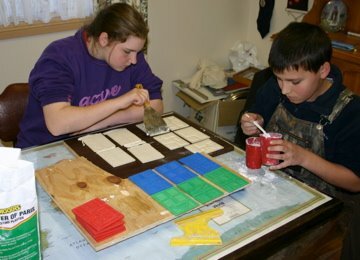 Hirst Arts also makes moulds and has a great instructional section including videos and detailed instructions and hints and tips. This is a picture of the Australian Bottle Brush. 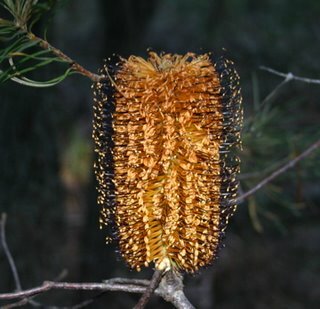 As you can see from the flower, it does indeed look like a bottle brush. 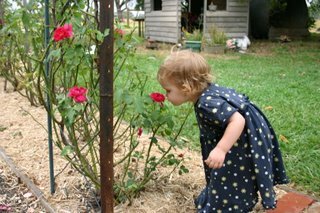 Australian native birds love the honey or nectar of these flowers and we are growing some on our property to attract the birds. Colours are quite varied, with Red being the more common colour. On the path we followed there are lots of these golden coloured bottle brush trees and a grove of big bad banksia men trees. Is that a real Gumnut baby? Today we went for a walk and took one of the Boys' "shortcuts" through the bush. We saw what May Gibbs could have referred to as "Gumnut babies". 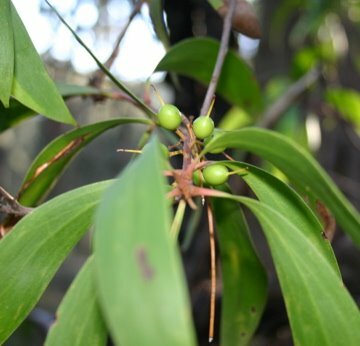 See how the little gum nuts (Eucalyptus tree seeds) look like little heads with pointy hats? 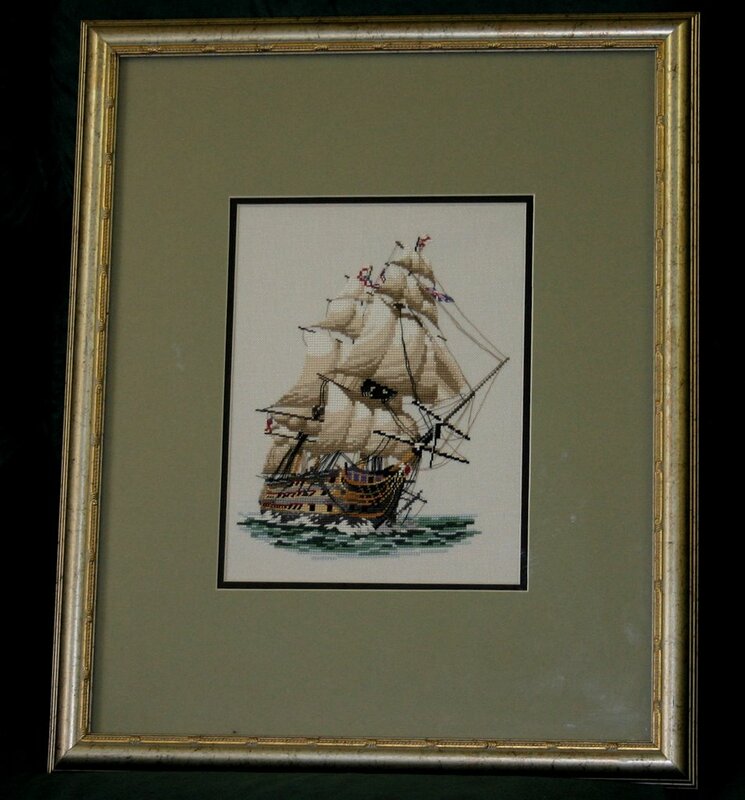 The cross stitch we showed previously was probably based on something like this. Kim from Life in a Shoe has posted the twelfth Children's Comedy Carnival. There are some fun posts and it is worth the trip. Our Night Tales finish off the carnival. We have been using the wood stove/heater almost continuously for the last few weeks and it has been getting less effective. 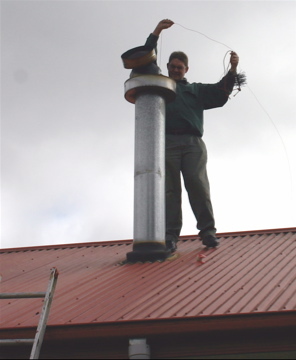 This meant the flue/chimney was probably full of rubbish and had to be cleaned. So we let the fire burn out last night (brrr!) and off I went to do my duty on the roof. We have a stiff brush with a ring at each end exactly the diameter of the flue. String is tied to each ring and a collection of spanners to one end to weight the string. Lana and Eric were inside catching the spanners and string and pulling. Once the brush was through I pulled. I'm not sure who had the harder job - me on the roof or Lana and Eric at the end where all the soot was falling. Once the stove was put back together Clare announced, "Hooray! It's cleaned. That's why Dads are good to have." I have been enjoying reading Musings from a Catholic Bookstore, especially the post regarding his experience of The Family Rosary. We initially thought he was describing some of the evening Rosary sessions at our house. He has just added Bruggie Tales onto the links at the side under "Mommy Blogs". Does this look like a Mommy Blog to you? I always thought of Bruggie Tales as a Family blog, or at least a Daddy Blog. However, it is nice to be noticed. Yesterday we were treated to very tasty Pumpkin Damper. 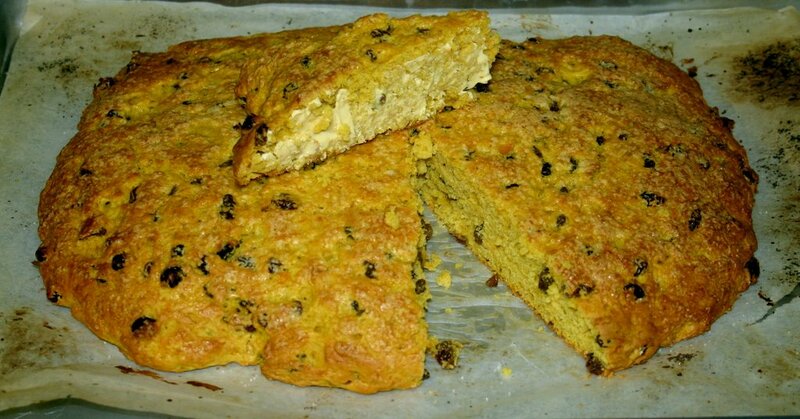 Normally damper can be a bit dry, but this recipe using pumpkin results in a delightful treat. And the best thing? You can't even taste the pumpkin! Nuke (microwave) or cook pumpkin and mash. Let cool. Stir in the egg, milk and sugar. Add fruit and pumpkin mix. Make sure it mixes really well as it will be too sticky to knead. Press onto a cooking tray about an inch (2 cm) thick. Brush with milk and sprinkle with sugar. You can even be creative and mark it with lines or pictures. Bake at 200C (400F) for about 20 - 25 minutes until Golden Brown. It should sound hollow when tapped. Serve hot or cold. Especially nice with butter! The Pink Diary is hosting a Carnival of Family Life. The Carnival is a collection of stories from across the web that illustrate a variety of aspects of family life. My shopping trip with Clare is included. 4. YOUR character traits and behaviors WILL show up in your children. As these manifest, the Lord uses them to let you see how you look to others. As you are training your child, the Lord will also be training you. It will make YOU a better person! This is listed as a Pro and I agree. We see so many of our traits in the children and together we learn to deal with them in a way we can all grow and learn to live together. Also I enjoying telling Lana all the faults in the children which must have come from her and how all those great gifts must have come from me. Bruggie Tales is One today! A year ago today we started this blog. Previously we had been sending out a little PDF newsletter to our family and friends in Australia and in the US about our experiences living in Georgia. Our first posting was for May 2005. We then back-posted the contents of all our previous newsletters to provide a complete history since arriving in the US in July 2003. Have a detailed history which should prove a treasure for us and our children in years to come. All in all we have enjoyed writing Bruggie Tales and sharing our lives with so many of you. Thanks for visiting and dropping in the occasional comments. 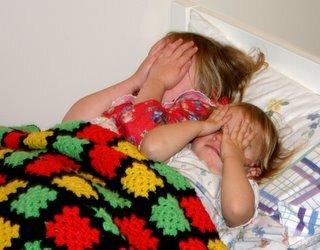 I'm not peeking.Sometimes bedtime can be a challenge. Our children have never admitted to being tired. Their heads may droop and their eyelids blink really slow, yet if we ask if they are tired, they sit up and declare, "No!" Last night Ariel turned out the light and Clare said, "I'm blind!" Ariel quickly responded, "Then go to sleep." Peter was mucking around and one of the other children deflected attention from themselves by letting us know. Peter defended himself with, "I'm not doing anything at the moment!" Sometimes we need to resort to the threat of providing them with "The Red Hand of Dad" or "The Red Hand of Mum", reminiscent of the White Hand of Sauron, although placed lower down and in a different colour. 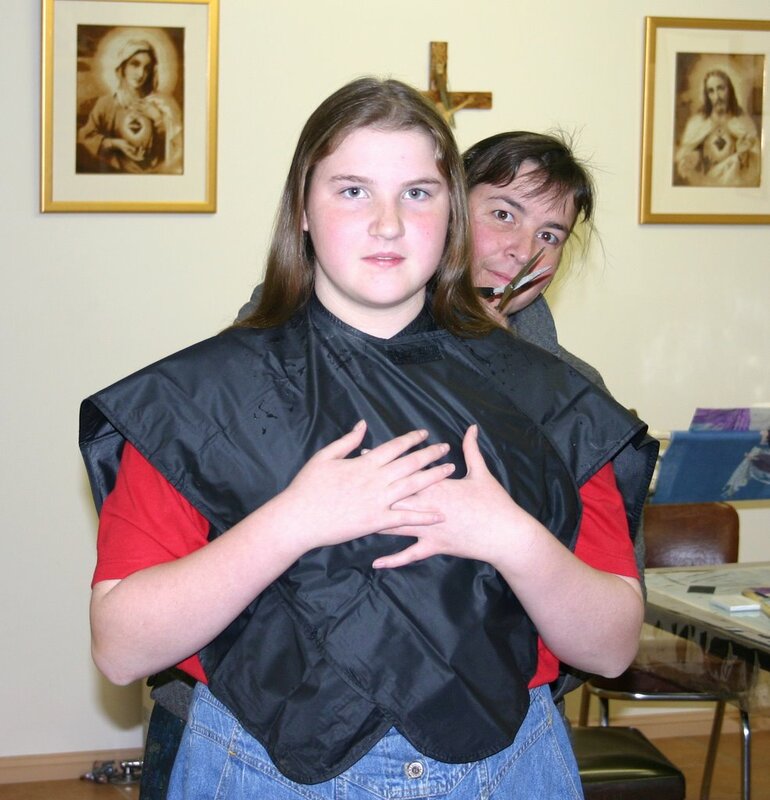 One method we use to save money is to cut our hair in-house. We purchased one of those trimmer sets for about the price of two haircuts and Lana learned how to cut hair. The boys are easy and as the girls grow their hair long, Lana only has to trim their loose ends whenever they go astray. I make sure Lana cuts the three boys' hair and then she cuts mine. It works out safer all round! 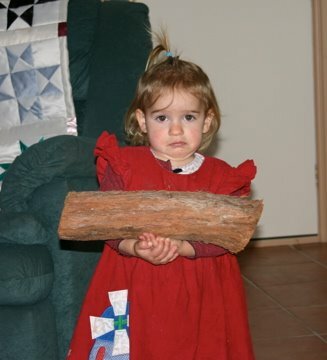 In a discussion on Magnum Opus, an email group for Catholic homeschooling families with four or more children, I compared the picture of one of the particpant's new babies to a gumnut baby. This led to the question, "What's a gumnut baby?" We then realised we hadn't shown these cross stitches Lana has made of gumnut babies. You will probably have to click the photo to get more detail. Gumnut babies are the invention of May Gibbs (1877 to 1969). She wrote many works focussing on the Australian flora and fauna and imagined a variety of creatures living within the unique Australian plants. The Big Bad Banksia Men were another example we have mentioned previously. Get to the fighting bit! I snatched this photo of the boys this afternoon. They were on the back deck in the sun with James sitting on the table reading a Children's Bible with Peter peeking over his shoulder dressed as a Haradrim (Lord of the Rings warrior). 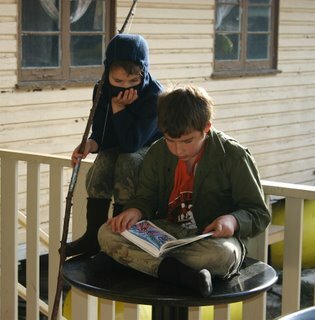 I just felt this was a great image of brothers spending time together. 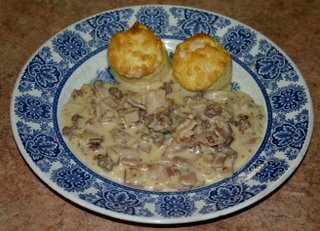 One of the culinary specialities of the US South is "Biscuits and Gravy". Our first thoughts on hearing the title was to think, "Why would anyone want to mix cookies [which is what we mean when we say biscuit] with gravy [juice from a roast]?" Whilst eating a hotel breakfast Lana and Ariel noticed some other patrons eating white sauce stuff with what looked like scones. Lana spoke to the other patrons and asked what it was. Recognising our accents and being very helpful they replied that it was biscuits and gravy. We then realised that in the US biscuits refers to a scone like thing and the gravy was a white sauce with fried sausage mince. Friends of ours then introduced us to what we called "The Breakfast of champions" whereby the sausage mince is fried with bacon and ham, and then flour and milk is mixed with the juices from the meat to make a very tasty gravy. 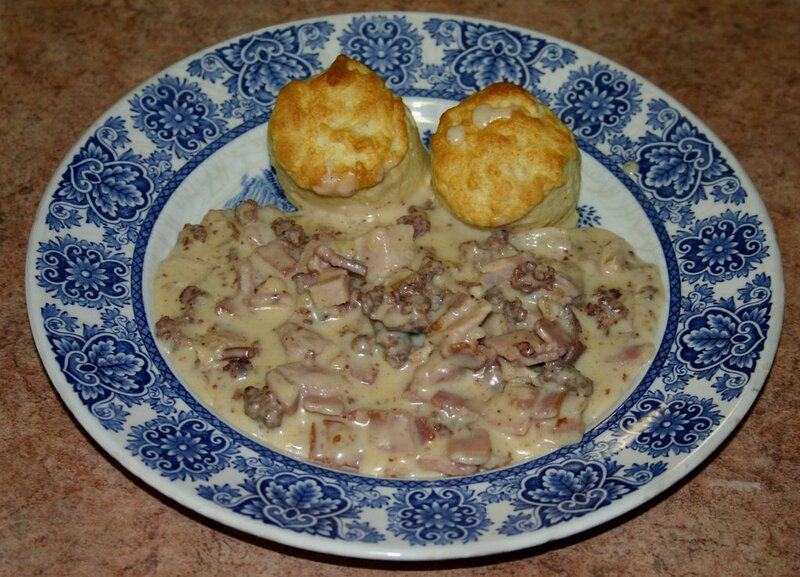 The gravy is then poured over the biscuits. Yum. We brought home a special seasoning the butcher/meat market in Georgia used and our local Australian butcher made up a batch of 25lbs/12kg of Breakfast Sausage. As he was handing over our purchases, the butcher commented, "that US mince smells all right." We had it for dinner as it is too nice just for a hurried breakfast! We have learnt a new language - Shakespearian English. As we have reported here previously, we started our discovery of William Shakespeare's plays with his comedies. We have now seen Taming of the Shrew, Comedy of Errors, The Tempest, As You Like it, Midsummer's Night Dream, Twelfth Night, Loves Labours Lost, Much Ado About Nothing, Merchant of Venice and tonight we saw The Merry Wives of Windsor. The subtitles have helped us understand the English spoken within the plays. When we first saw Taming of the Shrew it took 45 minutes before we realised they were speaking English. Now we are all laughing as the actors speak their puns and witticisms. Our first exposure to more serious drama was within Much Ado about Nothing when Hero is denounced by Claudio and Don Pedro at the altar on the wedding day. It all works out with much laughter, but as we work our way through the comedies we will be better prepared for the more dramatic plays. The BBC Complete Dramatic Works of Shakespeare collection is a great way to discover the roots of so many phrases we use regularly, and discover so many movie plotlines which are just a re-presentation of Shakespeare's stories. Once we have seen the play, Ariel reads the script. The interesting thing is that as all the family is discovering the plots of the plays, we are seeing references in other books and films and can understand the references. In one episode of Lucky Luke, starring Terrence Hill, Jack Dalton is carrying a spade for the "grave digging scene in The Twelfth Night". "There's no grave digging scene in Twelfth night!" I called out just before Lucky Luke said the same thing. Lana had a bad taste of Othello when she was in year 10 as it was killed by analysis in her English class. Every time a paragraph was read the teacher stopped and asked, "Now what did that mean? What are they saying?" Aaarrggh! How can you get the story if it is always being interrupted. Our plan is enjoy the plays, learn the language, and slowly move to the dramatic parts and have a discussion afterward. And as we are enjoying the plays we are getting requests for repeat viewings. The 37 play Collection is available in the US for over $1,500, or about $30 (US) per play! However it can be bought at MovieMail UK for 200 pounds. It is region 2 coding, but by buying a multi region DVD player you can save a fortune and have the complete collection. Think of it as an investment in English Literature and Culture. This week Kidzoo is hosting the Children's comedy carnival with lots of amusing tales from children. B7 wants the big apple. For her birthday Clare received the above three framed cross stitch pictures. Lana's Mum did the Ballerina and the Hummel children under an umbrella. Lana did Cinderella. Mum had shown Clare a picture of the ballerina she was going to do and Clare then began to remind Mum regarding her progress. At one point Mum was having a cup of tea and Clare asked, "Why aren't you doing my Ballerina cross stitch?" "I'm having a cup of tea." Mum answered between sips. Clare paused and thought. She pointed to a side table and said, "You could put the cup of tea down here." To cut short the time period of "reminders" Mum finished the pattern in four days! Over a couple of nights before Clare's birthday, while Clare was asleep, Lana and her Mum framed the pictures. Lana hung all the other pictures she framed and Clare began to cry. Clare answered between sobs, "You didn't hang any in my room." Two days later she opened her presents to see the above pictures which were very quickly hung up above her bed. 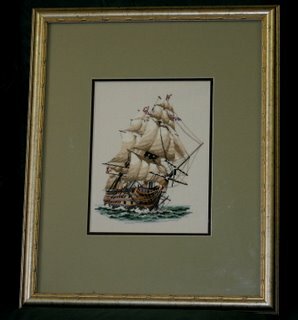 Lana has finally framed her picture of HMS Victory - a pattern by Heritage Stitchcraft. When Eric was five years old he received a birthday card from his grandparents with a classic ship like HMS Victory on the front. He was taken by the idea and asked Lana, "Mum, can you make me a ship like this?" "Ok, I will one day." He then gave me the card so I would know what he wanted. A short while later he noticed the card and put it on Lana's bedside drawers and commented, "I put it there so you wouldn't forget." Over a period of six weeks after Eic went to bed Lana completed the pattern. She presented it to Eric for his sixth birthday and he was very pleased. It has finally been framed, using the same method as the Hummel Apple Children, using a store frame and replacing the photo. It is finally hanging in the boy's bedroom and all is well in the world. By the way, Eric is now twelve years old. 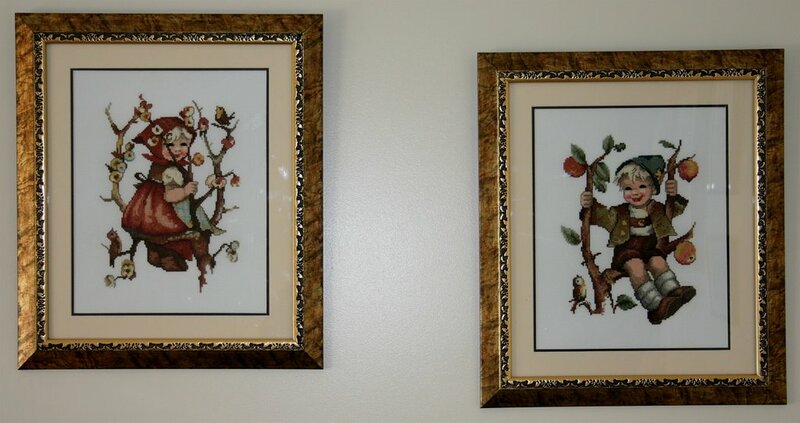 Lana has now framed the Hummel Apple Children shown previously. 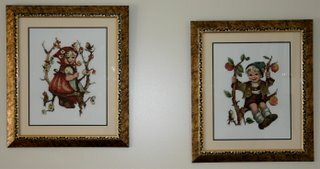 The frames are ones found at the discount store, with the photos removed. The matt boards were actually an appropriate colour and the frames are very nice. It was a simple matter of attaching the material to a backing board with special acid-free framing tape on the edges of the material and then lining up the matt board. A simple and cost effectve solution. The hardest part is getting the pattern square within the frame. 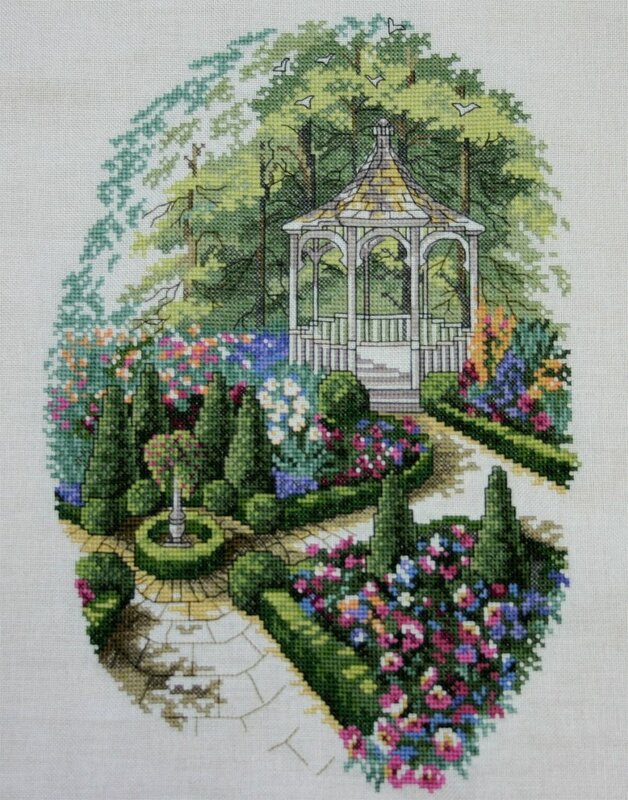 Lana has just completed The Gazebo, one of the patterns she was considering in The Stitcher's Dilemma. With non stitching gaps during our Queensland trip, it has taken about 6 weeks to complete. 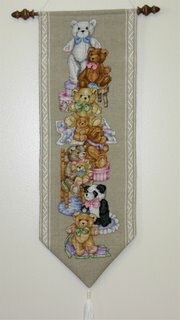 The pattern uses a combination of one and two strand stitches to provide depth and focus. The background and paving is mostly one strand giving a lighter effect. The back stitch around all the critical parts also brings out the gazebo, paving, plants and hedges. It was nice to be able to stitch a smaller pattern and finish it in a shorter time period. Lana has never really kept track of time each pattern takes but I think my accounting desire for measurement may be rubbing off! 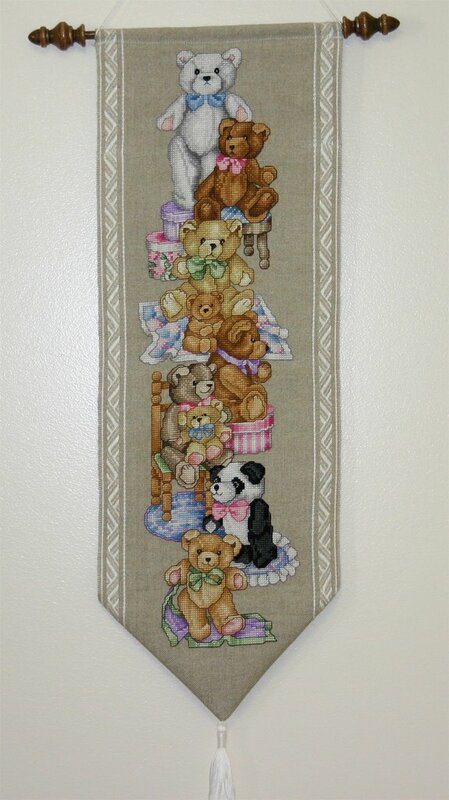 Lana had this chart of the Bear's Bell Pull by Vermillion Stitchery for some time and has finally gotten around to finishing it. Lots of partial stitches and colour changes but the result is quite nice. The boys and I call it the Uruk-Hai Bell Pull because early on it looked as though the top white teddy bear was holding the brown head of the next bear down. Lana finished off the thing with a simple fold and tassle and fancy rod holding it up. Sugar and sweet stuff - Dad bought me lunch! I do the shopping for the family and either I pick up bits on the way home from clients or go out on a special trip. The special trips tend to be big affairs as I always try to buy in bulk and keep the pantry stocked. I am joined by a random number of children (think of a number between one and six) and both sides benefit. I get some company and differing levels of assistance and the children get to suggest items to purchase. These suggestions aren't always the healthiest of choices but if they ask and don't nag they get some of their picks. Today I bought some lunch. Ariel and I had a meat pie but Clare had her eyes on a huge chocolate crackle, the size of a large muffin. Chocolate Crackles are a mix of rice bubbles/rice crispies, cocoa, sugar and Copha (solidified coconut oil) spooned into paper cups. As you can gather, this is not really a quality lunch but sometimes one just has to be a Dad and buy a non nutritious treat for the children. 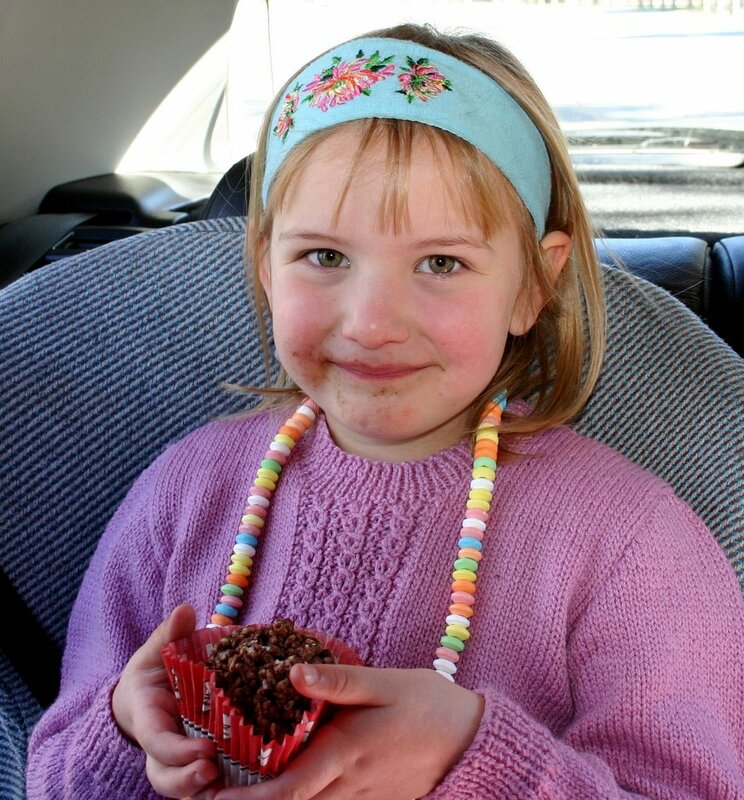 In this photo Clare is also wearing a lolly necklace. "I like shopping with you Dad!" says Clare. Yesterday one of my friends called me and told me of a song he heard where the singer explained how he became his own Grandpa. While he was talking I consulted "The oracle" (Google) and found the song and the music. The song was written in 1948 by Moe Gaffe and Dwight Latham and this version is sung by Ray Stevens. This led us to discover a whole new selection of comedy songs by Ray Stevens on iTunes. We are very grateful for our stay in "Suthen" (That's how Southern is pronounced) USA as we were able to understand so much more of the songs! 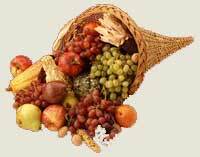 In one song, The Deerslayer" he is thankful for "Jimmy Dean". We now know that Jimmy Dean is a very popular brand of breakfast sausage, often used when making biscuits and gravy. Do I measure up to your standards? We have been keeping track of the height of all the family since February 2002. When we knew we were going to the US we transferred all the heights to a scroll of paper and brought it with us. 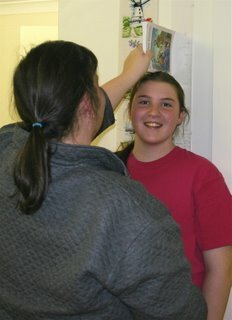 We have just unpacked the scroll and re-measured the children. Ariel is now taller than both her grandmothers! Lana was feeling shorter so we had to do the measurements. Last year when I was looking over our accounts I noticed that our food bill had increased by 20% over the prior 12 months. "How can this be?" I asked Lana, "I know I am buying better and in bulk." Lana looked at me steadily and replied, "Have you measured the children lately?" I looked around and realised the children had grown about 20% with a corresponding increase in stomach capacity. "Aha!" Our friend who visited yesterday also gave us a new wargame - Pirates of the Crimson Coast. 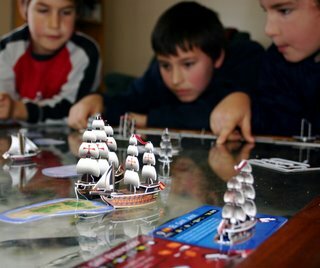 It is a very clever game using ships made from pressed out parts on cards. The boys have been playing this almost continuously since the game arrived. The boats come in small card sized packs and each pack is a complete game. Also, it is another use for our Treasure Table. Treasure below and treasure being fought for above! Lana and Ariel have been struggling over an Algebra problem the last few days. They were sure they were doing it right but their answer didn't match the answer in the book. By the time I returned home no one had fresh minds to remember the problem. Luckily a friend of ours dropped in on his way to a seminar yesterday and helped with the problem. The answer in the book was wrong! Lana and Ariel were very happy to know they were right after all. As our friend is a real Rocket Scientist we were able to reflect, "This isn't Rocket Science, you know." Blogging is currently a bit light due to work commitments. 13 hour days means that the weekends are the best time for me to update Bruggie Tales - unless Lana or the children post things! This weekend we will have a good showing of lots of Lana Craft so stay tuned. I have just discovered a source of 50 talks of Bishop Fulton Sheen. Bishop Sheen was an active Catholic bishop who, as part of his ministry, was one of the first successful television evangelists in the 1950's. He had the gift of understanding the complexities of the faith and then being able to disseminate and explain it to anyone. This week we make a double entry in the Carnival of Children's comedy. Ariel's Mind Boggle and Clare's gracious decision to let Jofus do her work for her are our contributions. A few days ago Clare wanted two ponytails in her hair, so Mum fixed her hair. Rose, seeing Clare's new hair style, wanted ponytails in her hair too. Do you know what she did? She came to ME! 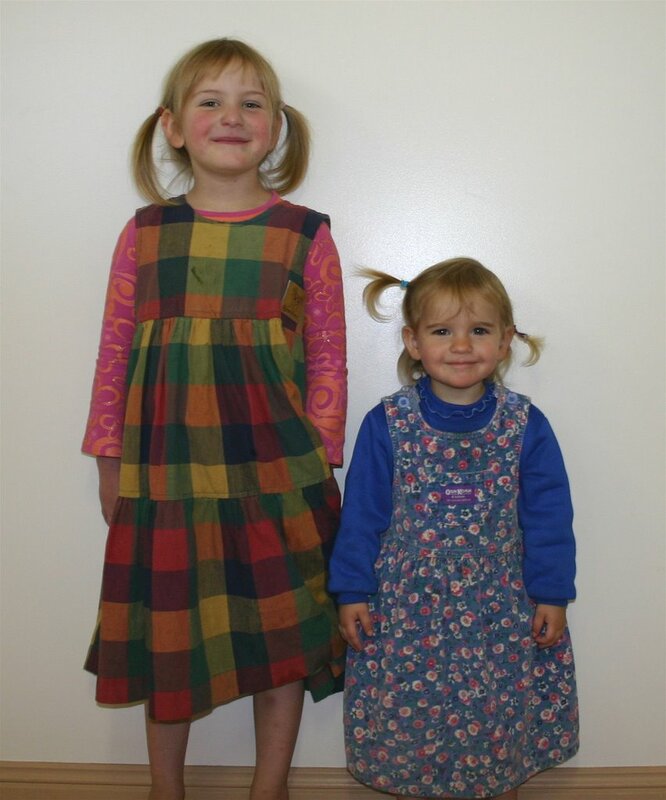 So I put ponytails in her hair, one was perfect but the other one wasn't so perfect (as you see in the photo). But Rose thought they were wonderful. Update: Following Alice's comment that Eric should get points for trying, he asked, "Do I get more computer time?" Nice try! The Bible Christian Society has finally converted all their talks to MP3s and they are available for free downloading. We discovered his free tapes when we were in the US and suggested he convert them to MP3's so they can be downloaded anywhere in the world. And now he has! We especially enjoyed his conversion story. John Holt is one of the fellows that promoted homeschooling back when it was a very "alternative" activity. Why Homeschooling has an interesting interview with Pat Ferenga who worked with John Holt in those early days and continued after John passed away. The interview provides a worthwhile glimpse of homeschooling past, present and future. Fruits of loveI drive many highway miles visiting clients. Normally I listen to audio books, but at times I use the time to ponder life's mysteries (or work out tricky client issues). When my thoughts cover deeper matters we have a family discussion. Today's thoughts were on Love. In order to discover anything's purpose, the best results are obtained by referring to it's maker. We understand that for software or equipment we would consult the manual or maker's web site or the creator himself. To discover more about ourselves, the best option would be to consult the One who made us. So what did He have to say? - Jesus also told us that the greatest commandment is to love the Lord with your whole mind, heart and soul. The last instruction of Jesus is commonly rephrased as our duty to Know, Love and Serve God. It also follows that you can't serve someone properly if you don't love him and you can't love him if you don't know him. So the first step is to know the person you are to love. That means being with him and spending time with him. This makes sense when you stop and consider. Look at the successful marriages and friendships. They survive in wealth and poverty, sickness and health and in better times or worse. They communicate across crowded rooms with a glance or slight facial expression. They laugh at the same jokes and shared experiences. They are happy even in adversity. They really know each other. And they desire to know more. Knowing each other means their love is stronger. Stronger Love means the willing sacrifice of self to the other. And, strangely enough, the giving up of self results in greater love and knowledge. The 100%/100% giving within marriage results in 200%, rather than the 50%/50% split which often results in zero. That's God's maths - drawing straight with crooked lines. In fact the two who become one, often become three, four and more. But, Ariel asked, "What if you don't know your talents?" Study and follow where it leads you. Understand more of the core skills and then delve deeper into subjects that interest you more. God always throws things your way and you must be ready to take the risk and say "Yes." There are so many stupid PC design decisions, but this one is obviously made by a fellow that has no children. You can see the problem in our previous post (back in August), namely a big lit power button on the front of the box. Luckily, the solution is pretty easy. Go to Control Panel/Power options, select the advanced tab, and where you are asked "When I press the power button on my computer:" select "Do Nothing". This post is inspired by a Rose initiated shudown on a PC I hadn't fixed yet. Once James completed his schoolwork today he asked the whereabouts of Eric. Ariel responded, "We mind boggled him!" Lana started laughing and we had to explain the better phrase would have been "used telepathy" or something similar. Now we have a new phrase whenever someone uses alleged mind powers to influence events - they have been "Mind Boggled". The ongoing series of homeschooling carnivals contnues with number 18 hosted by The Thinking Mother. This is a huge list of interesting articles of interest to anyone that wants to know more about that life choice called "homeschooling". Our article on the homeschooling family camp is included. I especially enjoyed this post: 50 Reasons why I could never homeschool. Today I went to look at the Bruggie Tales and all it showed was the header and most of the left side. No posts at all! Aaargh! I went to check my template and it was blank part way down. The tricky bit was that I had updated the template yesterday and it all looked well. There was an update problem but it seemed to work. More fool me. Luckily I had a backup which was mostly current. I quickly updated the template and all is well again. Once again we remember why Jesus would make a good computer user. Update: To back up your template go into the Template editor, copy all the text (Ctrl A) and paste it into Notepad or a text editor and save. That way if it all goes Kaboom! just copy and paste it back.